Tags: Antique Map, Asia, Batavia, Indonesia, Jakarta. Antique Map Batavia by Leti titled ‘Waere affbeeldinge Wegens hets Cafteel ende Stadt BATAVIA/gelegen opt groot Eylant JAVA Anno 1681’. The very rare and sought after large map of Batavia in 1681 in old colour published by the Italian historian Gregorio Leti (1630-1710) and based on the earlier map of Batavia published by Clement de Jonghe in 1650. The plate was acquired by the prolific Dutch map and chart maker Frederik de Wit sometime after 1681, and published in his Townbook of Europe, Theatrum Praecipuarum Totius Eurpoae Urbium tam ichnographice Delineatarum ….. t’Amsterdam, by Frederick De Wit in Amstrdam in 1693. Although entitled the Townbook of Europe, De Wit did include plans of four cities outside Europe including Constantinople, Jerusalem, Goa and Batavia at the end of the atlas. Batavia was the last map, numbered 132 (Koeman, Wit 28, Vol. III, page 210).This edition was published in 1690 by Gregorio Leti (BAT K21 in Brommer). 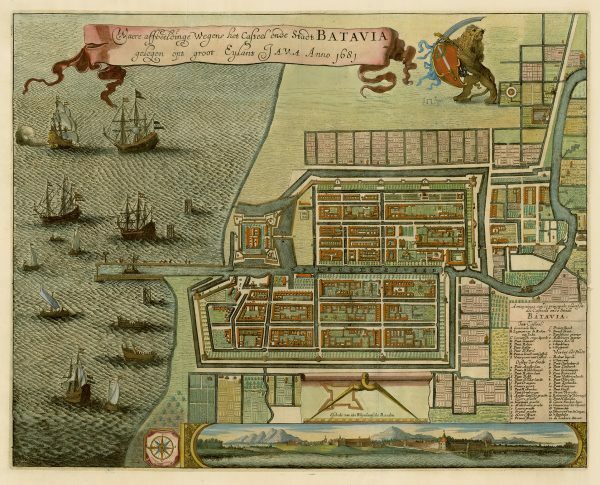 The imposing view of Batavia from the sea was originally engraved by Johannes Vingboons probably around 1650 as a commission from William Blaeu for whom he worked. Color: Old color, with some modern retouching.